Conveyor systems have been a mainstay of material handling for over 100 years. Overhead trolleys and belt conveyors were moving materials in manufacturing plants before the forklift was even invented. New configurations and sophistication of controls have kept conveyor systems in the state-of-the-art category with other automated material handling systems. The extensive range of applications for conveyers allows their use in small "mom and pop" type operations as well as in tier 1 manufacturing and distribution operations. Conveyor is very cost effective and the ease of expandability and reconfiguration makes it ideal for growing operations. A little imagination and a small investment can do wonders for reducing manual material handling through the use of conveyor systems. Also see Hytrol's ABC Conveyor Book, an online guide to conveyor information and specs. Gravity flow skate wheel conveyor is a low cost option for conveying lightweight cartons, trays, or totes. Used extensively in shipping/receiving and assembly areas, skate wheel conveyors reduce manual material handling of lightweight items over short distances. I've used gravity skate wheel conveyor in elaborate configurations as well as in small 1 or 2 section stand-alone units.. Application for gravity roller conveyor is similar to that of gravity skate wheel. Its cost is a little higher and it is more effective where heavier items are being handled. Automated belt conveyer has similar applications to gravity roller and skate wheel. Single units can be incorporated into gravity conveyor systems to create a simple low cost semi-automated system. The automated version of gravity roller conveyor, automated roller conveyor is used extensively in large conveyor systems. A version of automated roller conveyor called Zero-Pressure Accumulating Conveyor is especially useful in avoiding the pressure buildup which normally occurs when product accumulates at a stationary operation. Used extensively in shipping/receiving operations for package handling, flexible conveyor is usually anchored at one end to fixed gravity or automated conveyor allowing the other end to be expanded and flexed into trailers for loading and unloading. 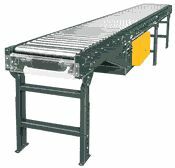 Unit Load Conveyor is a heavy duty version of roller conveyor used for handling pallet loads or larger totes or trays. Unit load conveyer can be gravity flow or automated and may be installed elevated or recessed into the floor.. This shows an application of conveyor in high volume trailer loading/unloading. The section in the track in the floor automatically extends into the trailer during loading. 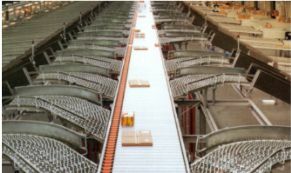 Sortation systems are the key to large elaborate conveyor systems. The variety of sortation systems is extensive as are their applications. Most frequently used in high volume case quantity and piece quantity picking, shipping, and parcel processing operations, there are also sortation systems for unit load system.